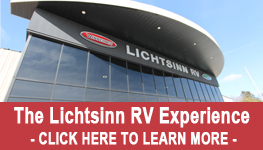 EXPERIENCE THE BEST with the Lichtsinn RV Service Department. We have Factory Trained RVIA/RVDA Certified Technicians to service your motorhome, travel trailer or fifth wheel. This certification provides you the assurance that the technician working on your RV has the specific skills needed to do so. Our Flying W Customer Satisfaction Index Scores rank in the best of class for Winnebago Dealers! We have recently expanded our Service Department which has allowed us to increase our services offered, now including full tire service. More importantly, this expansion allows us to take care of more of your service needs.